Harry Sidebottom, 'The Late Roman Empire: History and wargaming - Changing to survive'. 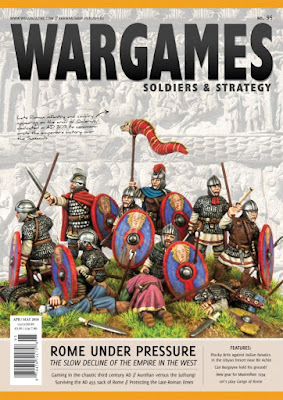 Mark Backhouse, 'Northern Italy AD 271: A mini campaign - Aurelian and the Juthungi'. Michael Leck, 'Don't make the Vandals angry - Escape from Rome'. Daniel Mersey, 'A barbarian raid beyond the Limes - Crossing the bar'. Guy Bowers, Building a Late Roman Army - Against the fall of night'. Sascha Herm, 'Painting the cover - The Battle of Adrianople'. Jamie Gordon, 'Bitesize action in the Holy Land - Taking the cross'. Steve Jones, 'A hypothetical AWI scenario - A fickle flanking force'. Lon Teal and Ara Harwood, 'New goodies for Maximillian 1934 - If driving fast cars you like... anything goes'. Mark Backhouse, 'A fictional platoon-level scenario in the Libyan Desert - Bir Achin'. Dread Lunn, 'Painting a Russian SU assault gun - Weathering the Rasputitsa'. Tony Harwood, 'A steam-powered bean engine - Building a Newcomen'. Henry Hyde, 'Tabletop tactics - Horse and musket-era cavalry'. Chris King, 'The irregular - Tracking the troops'. Mark Backhouse, 'Skirmishing in the streets of an ancient city - Let's play Gangs of Rome'. 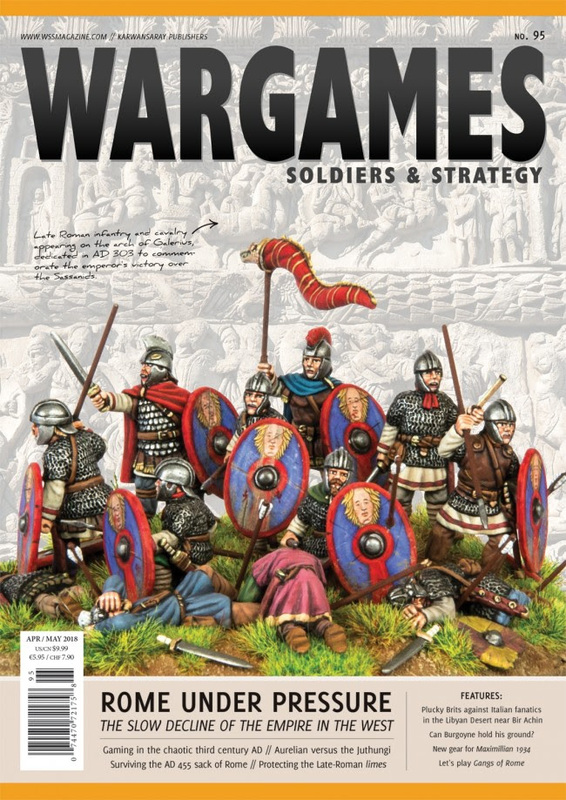 David Davies, Rossco Watkins, Guy Bowers, and Chris Payne, 'Game reviews - Outremer, Blood and Faith: Skirmish Level Crusading, Kobolds & Cobblestones, Wars of Insurgency, and 'Nam'.